One year and one week since the release of OS X Lion, Apple is back with Mountain Lion, also known as OS X 10.8. Like Lion, Mountain Lion offers numerous feature additions that will be familiar to iOS users. This OS X release continues Apple’s philosophy of bringing iOS features “back to the Mac,” and includes iMessage, Reminders, Notes, Notification Center, Twitter integration, Game Center, and AirPlay Mirroring. There are even a few features that are making their debut with Mountain Lion, and will find their way back into iOS 6 this fall. 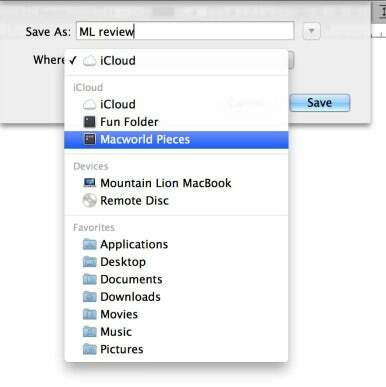 As the first OS X release post-iCloud, Mountain Lion offers a much more thorough integration with Apple’s data-syncing service than Lion offered. Mountain Lion also brings options to limit which kinds of apps users can install, offers systemwide integration with social networking and media-sharing services, and gives some recent MacBook models the power to keep working even when they appear to be asleep. And although there are no actual mountain lions in China, OS X Mountain Lion does add a raft of features to speak to users in the country that’s Apple’s biggest growth opportunity. At $20, Mountain Lion is Apple’s cheapest OS X upgrade since version 10.1 was free 11 years ago; like Lion, Mountain Lion is available only via a Mac App Store download. The combination of the low price and the easy download will likely make Mountain Lion the most quickly adopted OS X upgrade of all time. Given how solid a release I found Mountain Lion to be, that’s a good thing. iCloud documents in an icon view. In 2011, in his last public event as Apple CEO, Steve Jobs introduced iCloud—Apple’s Internet-based system of data storage and synchronization. At the time it was clearly a major strategic move for the company, and users of iOS 5 have benefited from several nice features, including cloud backup and preference syncing across devices. On the Mac, iCloud integration has been limited. OS X Lion was finished before iCloud arrived, which prevented Apple from deeply integrating the two. But Mountain Lion and the forthcoming iOS 6 (due this fall) make much better use of iCloud and—most impressively for users of both Macs and iOS devices—use iCloud to work together. It starts at setup: In Setup Assistant, the system asks for your iCloud ID and will sync a bunch of core preferences—essentially the information stored in the Mail, Contacts & Calendars pane in the System Preferences app. With this single log-in to iCloud, all your email accounts, contacts, calendars, notes, reminders, and the like, will be available on the Mac you’re using. These features won’t bring over all your files from an old Mac (you’ll need to use Migration Assistant for that), but imagine a future where most users’ apps are purchased on the Mac App Store, and most apps store their documents in iCloud. In that world, logging into iCloud from a new Mac will be almost as seamless as restoring from iCloud on an iOS device. This is definitely the direction Apple is headed in, even if Mountain Lion doesn’t take users all the way there. iCloud documents in a list view. Here’s how it works: Instead of the traditional Open dialog box, there’s a new box with two options: iCloud and On My Mac. 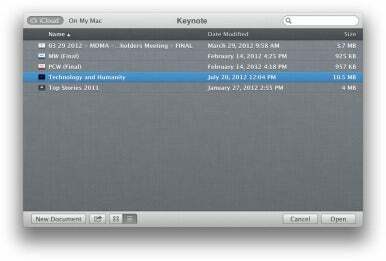 On My Mac is the “traditional” Mac file picker, pretty much the same concept as the one introduced back in 1984. 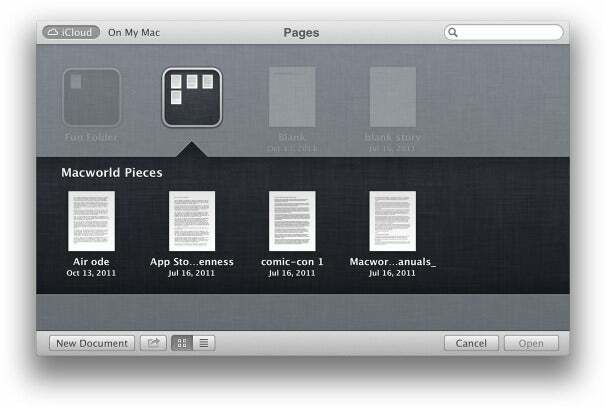 But the iCloud option reveals something quite different: a view of all that app’s documents that are stored in iCloud. By default, this icon-based view shows icons sorted with the recently modified files at the top, though you can also switch to a list view and sort by name, date, or size. When I first opened Pages on my Mountain Lion-powered Mac, I was greeted with a collection of documents I didn’t expect to see—they were all items I had created over the past year on my iPad using Pages. I was able to open them and edit them, and the edits showed up almost immediately on my iPad, too. When the process works, it’s nothing short of magical. The save dialog box lets you choose a location on iCloud or your local drive. Similarly, when you create a document in one of these apps and try to save it, by default the Save dialog box is set to iCloud. You can switch over to your Mac’s hard drive if you want, but I’d wager that average users will just save their file to iCloud and not worry about navigating their hard drive’s file hierarchy. Many expert users will blanch at the concept of not using the traditional file system, but Apple believes that most computer users struggle with finding files and traversing file systems. Between Launchpad and Documents in the Cloud, many novice Mac users will increasingly find little reason to use the Finder. Having seen plenty of friends and relatives struggle with file management, I’m inclined to agree with the company. The good news for power users is, Apple doesn’t seem committed to ruining the experience for people who want to save files on their hard drives. It’s easy to move files back and forth between iCloud and your Mac hard drive, the Finder hasn’t gone away, and Launchpad is utterly ignorable. Even as an experienced power user, I see the appeal of Documents in the Cloud. It’s certainly easier to find a file you were working on recently in a view that shows only one app’s files with the most recent stuff sorted to the top. It’s not that different from what I tend to do these days when I’m trying to open a file: Launch the app, go to the File Menu, and look in the Open Recent submenu to see if the file I want is still there. The menu that appears when you click on a document’s title at the top of its window is much more useful now. Unsaved documents still appear in iCloud even if you never press Save. There are a lot of really useful touches that will appeal to everyone. But Documents in the Cloud is not all silver lining. Some file types—text files, for example—can be opened by all sorts of different apps, yet Documents in the Cloud doesn’t share files between apps. For example, there’s no way to insert an image into a Pages or Keynote document via iCloud short of opening Preview, grabbing the file from its iCloud window, and dragging into a page or slide. That seems less than ideal. And while iCloud is free, that’s only for the first 5GB of data. My iPhone and iPad backups already nudge me close to the limit; adding a bunch of giant Keynote presentations will probably push me over the edge. If Apple wants people to embrace Documents in the Cloud, it might want to give users a bit more iCloud space without charging them for the privilege. But still: With Mountain Lion, it’s a lot clearer to see how iCloud will benefit everyone who uses Apple products by tying those products more closely together and eliminating a lot of fussing and fiddling with files. The Notes app is everything Stickies is, and a lot more. With Mountain Lion, Apple is continuing the approach begun in Lion to sync up the look, feel, and even nomenclature used by OS X and iOS. The Address Book app is now Contacts, as on iOS. iCal is now Calendar. More notably, there are a handful of new apps that have been built specifically to match up with iOS counterparts—and to sync data across devices. 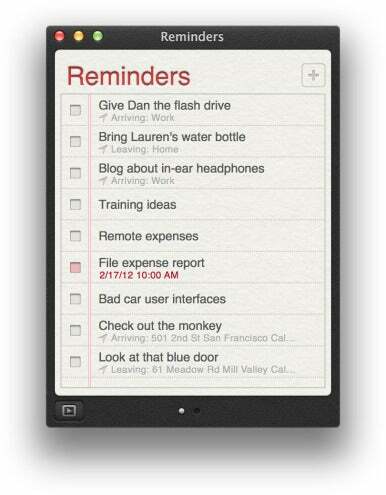 The Reminders app looks and works very much like its iOS counterpart. The new Reminders app, which looks more or less identical to the iOS version introduced with iOS 5, syncs your reminders via iCloud. It supports the same basic to-do list functionality as its iOS counterpart, and you can set location-based reminders that will (for example) trigger alerts on your iPhone when you enter or exit a particular place. It’s hardly going to give complicated task-management apps a run for their money, but that’s not always Apple’s goal when it builds an app into its operating systems. This is an app for people who want a basic set of checklists synced across all their devices. With its yellow college-ruled interface, the Notes app will be instantly familiar to iPhone and iPad users. It’s also a suitable replacement for Stickies, the venerable utility for jotting down a few notes to yourself. But Notes on the Mac has a few extra tricks up its sleeve: It supports rich text with different fonts, hyperlinks, bulleted lists, images, and even file attachments. 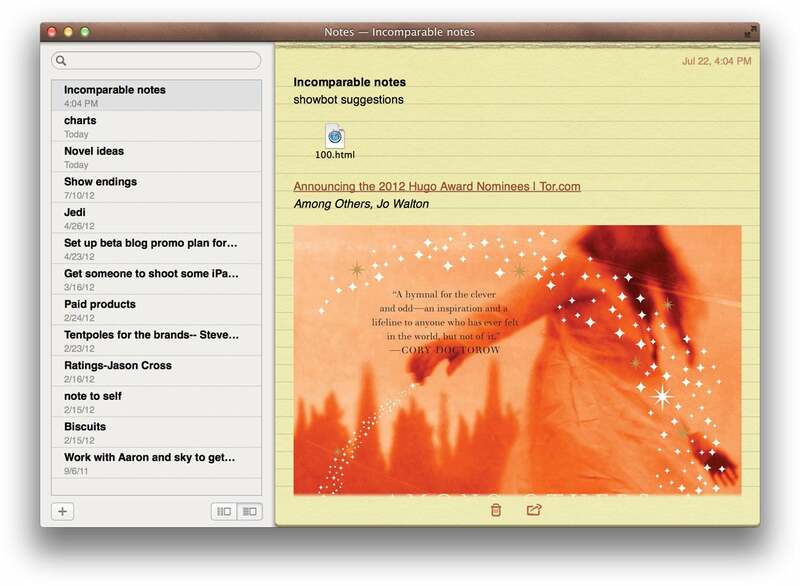 The Notes app on iOS and Mac sync together, of course, so instead of having various separate notepads on all your devices, all your notes are with you at all times. It really works, and it’s been useful enough to prompt me to start using Notes on my iPhone. 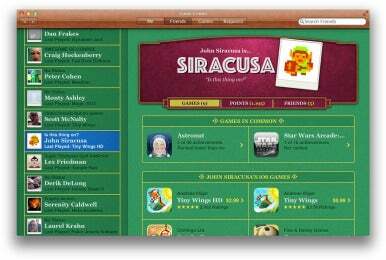 Game Center now covers Mac games, but shows you your iOS games too. Notes doesn’t use the iCloud syncing, though, which is kind of an odd choice. This is a legacy of the previous way you saw Notes in Mac OS—as a special mailbox in the Mail app. That always felt like a bizarre feature, and it’s good that Apple has finally broken Notes out into its own app. But behind the scenes, Notes still uses the IMAP email standard to sync, which means you have to have a valid IMAP email account entered in the Mail, Contacts & Calendars system preference pane in order to use the syncing feature. It’s something Apple should probably just migrate to iCloud for simplicity’s sake. There’s also a new Game Center app, which finally brings Apple’s buddy system for games across from iOS. Yes, you can log in, add buddies, and see what games your friends are playing from the app. But the app isn’t as important as the fact that Game Center is now available to Mac game developers. By taking advantage of Game Center, developers get access to buddy lists, a ranking system, in-app voice chat, head-to-head gameplay, and gameplay across Apple platforms. Expect a flood of Mac games that are versions of games previously seen on iOS. Messages provides a new single-window interface with recent conversations sorted to the top. Blue bubbles signify messages sent via iMessage. In 2011 Apple introduced the iMessage communication system, a replacement for text messaging that let iOS devices communicate directly with one another. Unlike SMS text messages, the iMessage system transfers data (not just text, but images and files) via the Internet, so there are no text charges. 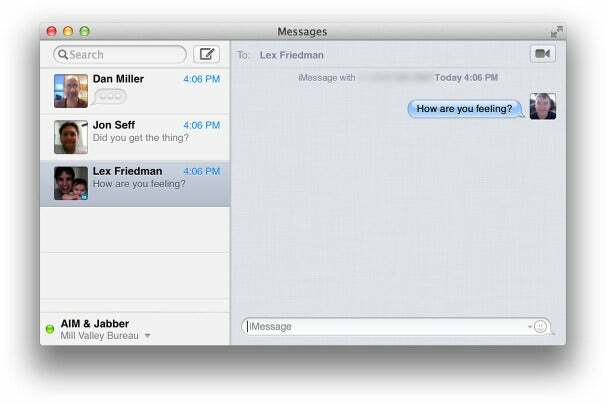 With Mountain Lion, support for iMessage comes to the Mac as well. And it happens via the Messages app, which is a renamed version of iChat with all its old features intact, plus support for iMessage. Like Messages on the iPhone, Messages for Mac lets you hold multi-person chats and can optionally let people know when you’ve received and read their messages and when you’re typing a reply. An integrated video-chat button allows you to kick off a video chat with capable devices, either over traditional instant-messaging systems (as iChat has always done) or by launching the FaceTime app. There’s a lot to like about having access to iMessage on the Mac. When I’d receive a message on my iPhone while working on my Mac, I’d be frustrated that I had to type out a response on my iPhone keyboard rather than the big Mac keyboard right in front of me. It’s now really easy to send a quick text message to my wife when I’m at work—all I have to do is type her name in a new Messages window and then type a message. This isn’t to say that there aren’t frustrating things about Messages, or iMessage in general. It’s great that using iMessage means you have a record of your conversations on all of your devices, and it makes it easy to keep on having a conversation even if you have to shut down your Mac and head for the bus stop. But every time I receive a message via iMessage on my Mac, my iPad and iPhone also chime or vibrate. Not just at the beginning, but every single time I receive a message. There should be a way for Apple to detect which device I’m actively using to have the iMessage conversation and stop ringing the rest of them. I shouldn’t have to mute my iPad and pull my iPhone out of my pocket in order to have a conversation on my Mac. I also found a strange, recurring bug when I was logged out of all my services and couldn’t log back in until I opened the preferences window, deactivated the account, and then re-activated it. The bottom line is that I love the idea of iMessage, relish not worrying about the cost of text messages, and am happy that I can send things via iMessage from my Mac. But Apple needs to focus on making the cross-device experience a little less obtrusive.